There is an ancient prophecy that gives us hope in these modern times of rapid and unsettling global change. This prophecy has good and bad news. The good news: There is a state of civilisation coming that will be sustainable – forever! The bad news: It’s not our current civilisation. The best news: we can still be a part of it, and it’s not that far out of reach. 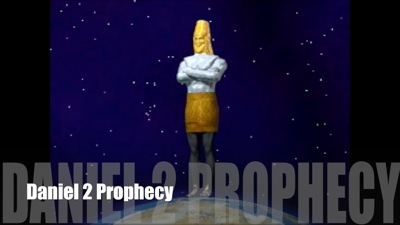 Where is this prophecy? It’s in the Bible, in Daniel chapter 2. One thing I love about the Bible is that it is intellectually reasonable. It does not require us to leave our brains outside. Daniel 2 provides evidence so that faith need not be blind. What’s in the prophecy of Daniel 2? The prophecy outlines the major world empires from the time of writing (Babylon) through to today, and into the future beyond. The prophecy has got it right for everything up to now (6 out of 7 predictive elements), with only one main event remaining. Babylon would be overthrown by an inferior kingdom which would rule all other nations. The second kingdom would in turn be overthrown by a third kingdom which would again rule the nations. The third kingdom would in turn be overthrown by a fourth kingdom which would again rule the nations. But the fourth kingdom would not be completely conquered by any further world-dominating power. It would be divided, along with other kingdoms, but still continue in some form. There would be efforts to reunite the divided kingdoms, including through intermarriage. These efforts would not succeed. In the time of the divided nations, God would establish an eternal kingdom. Rome was never completely conquered and its influence has extended until now. There have been several attempts to unite Europe through intermarriage and military campaigns. At one point Queen Victoria was the “grandmother of Europe“. Military campaigns have been led by Charlemagne, Charles V, Louis XIV, Napoleon, Kaiser Wilhelm II, and Hitler. Some of these knew they were fighting prophecy, such as Kaiser Wilhelm, who removed the head from a statue of Daniel at the Metz Cathedral and replaced it with his own. All attempts to reunite Europe under one rule have failed. God’s kingdom has not yet been established. If and when this does happen, it will truly be earth recycled! When was this prophecy actually recorded? Many critics have taken the view that it must have been recorded after most of the events actually happened. But there is good evidence that it was written prior to most, if not all, of these events. According to the text, the prophecy was recorded at the height of the Babylonian kingdom – the 2nd year of Nebuchadnezzar’s rule (603 BC). It would be reasonable to ask for corroborating evidence that it wasn’t written much more recently, when most or all of these kingdoms had come and gone. There are three strong external pieces of evidence that all date it at least before the fall of Rome, or earlier. The widely regarded historian Josephus provides an account of Alexander the Great’s conquests in establishing Greece as a world empire. When Alexander invaded Judah in 332 BC, Jewish priests showed him the book of Daniel. Daniel chapter 8 clearly predicts that a Greek would overthrow the Persian rule. As a result, Alexander treated the Jews very favourably. This places the prophecy at least before all but the first predictive element – i.e., prior to Greek rule. Source: Flavius Josephus, The Antiquities of the Jews, Book 11, ch. 8, in W. Whiston, Editor, The Complete Works of the Learned and Authentic Jewish Historian Flavius Josephus (London: J.F. Tallis, undated), p. 237-238. Large portions of the book of Daniel were found in the Dead Sea Scrolls at Qumran. This places the prophecy at least before all but the first two predictive elements – i.e., prior to Roman rule. Numerous New Testament manuscripts record Jesus quoting from the book of Daniel, placing the prophecy at least before the fourth to sixth predictive elements – i.e., prior to the fall and division of the Roman empire. This prophecy predicted accurately around 2,600 years ago that there would only ever be another three world empires (focusing on the then-known world). After that the nations would never completely unite, but with Rome’s influence continuing in some form. Quite remarkable! Since all that has happened accurately, is there any reason to doubt whether the future will follow how the prophecy concludes? This gives us hope that the present rapid global change, and the seeming insurmountable global issues, will have a resolution – and a good one at that!